Background and objectives Metabolic acidosis contributes to muscle breakdown in patients with CKD, but whether its treatment improves functional outcomes is unknown. The choice of dose and tolerability of high doses remain unclear. In CKD patients with mild acidosis, this study evaluated the dose–response relationship of alkali with serum bicarbonate, its side effect profile, and its effect on muscle strength. 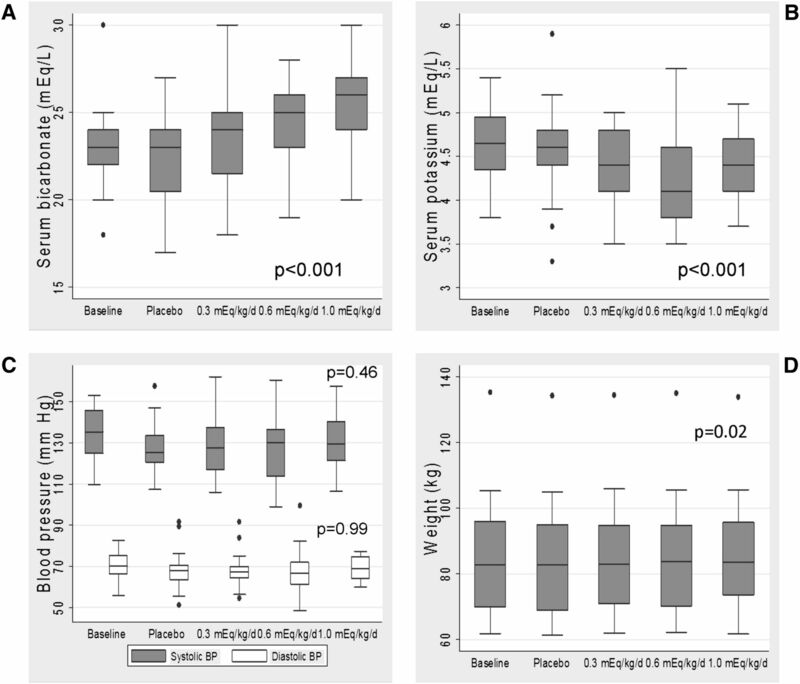 Design, setting, participants, & measurements In this single-blinded pilot study from March of 2009 to August of 2010, 20 adults with estimated GFR 15–45 ml/min per 1.73 m2 and serum bicarbonate 20–24 mEq/L were treated during successive 2-week periods with placebo followed by escalating oral NaHCO3 doses (0.3, 0.6, and 1.0 mEq/kg per day). At each visit, handgrip strength and time required to complete 5 and 10 repetitions of a sit-to-stand test were measured. Results Each 0.1 mEq/kg per day increase in dose produced a 0.33 mEq/L (95% confidence interval=0.23–0.43 mEq/L) higher serum bicarbonate. Sit-to-stand time improved after 6 weeks of oral NaHCO3 (23.8±1.4 versus 22.2±1.6 seconds for 10 repetitions, P=0.002), and urinary nitrogen excretion decreased (−0.70 g/g creatinine [95% confidence interval=−1.11 to −0.30] per 0.1 mEq/kg per day higher dose). No statistically significant change was seen in handgrip strength (29.5±9.6 versus 28.4±9.4 kg, P=0.12). Higher NaHCO3 doses were not associated with increased BP or greater edema. Conclusions NaHCO3 supplementation produces a dose-dependent increase in serum bicarbonate and improves lower extremity muscle strength after a short-term intervention in CKD patients with mild acidosis. Long-term studies are needed to determine if this finding translates into improved functional status. Metabolic acidosis is a common complication of advanced CKD (1). Recently, studies have begun to assess its contribution to the morbidity experienced by patients with nondialysis-dependent CKD (2–4). Acidosis may contribute to loss of muscle mass through abnormal muscle signaling, IGF-1 dysregulation, insulin resistance, and inflammation (5–9). Animal models have shown that acidosis promotes muscle proteolysis through impaired phosphatidylinositol 3-kinase (PI3K)/Akt signaling in skeletal muscle (5,6). Notably, this pathway mediates the anabolic and anticatabolic effects of IGF-1 and insulin (10), implicating acidosis as one cause of the resistance to both hormones seen in uremia (6,8). In humans with advanced CKD, treatment of severe acidosis has produced improvements in anthropometric measures of lean body mass in some (2,11,12) but not all (13–15) reports. These data suggest that treating acidosis might improve muscle strength and function by reducing muscle breakdown and preserving, or even increasing, muscle mass, which could positively affect the poor physical function and exercise capacity of patients with CKD (16,17). Although acidosis seems a prudent target for intervention, the effect of its treatment on functional outcomes has not been addressed previously. Although alkali therapy has been examined in numerous studies, the dose–response relationship with serum bicarbonate remains uncertain. A variety of doses have been used in published studies, and the choice of dose remains unclear. There remains a concern over side effects of alkali, most notably fluid retention, especially with higher doses. Clinicians often titrate the dose of oral sodium bicarbonate based on the change in serum bicarbonate and may be reluctant to increase the dose in patients with edema or hypertension. Therefore, in CKD patients with mild acidosis, we performed a pilot study to examine the dose–response relationship of serum bicarbonate to increasing doses of oral sodium bicarbonate and the tolerability of each dose. We also examined the effect of oral sodium bicarbonate on muscle strength, urinary nitrogen excretion, and parameters related to the IGF-1 axis and inflammation. Twenty adults greater than 21 years of age with estimated GFR (eGFR) 15–45 ml/min per 1.73 m2 and serum bicarbonate 20–24 mEq/L were included. Eligibility was determined from the most recent clinical laboratory data available for each person. Individuals were ineligible if they met any of the following criteria: systolic BP>160 mmHg; moderate or greater lower extremity edema; decompensated heart failure; had previously received chronic treatment with sodium bicarbonate, calcium carbonate, or baking soda; had a history of kidney transplantation; were treated with immunosuppressive medications during the previous 3 months; or initiation of ESRD treatment was planned within 6 months. The Committee on Clinical Investigation at the Albert Einstein College of Medicine approved this protocol. The study was registered at ClinicalTrials.gov (NCT00888290). Participants were blinded to treatment status. After the initial study visit, participants received placebo pills for 2 weeks followed by increasing doses of sodium bicarbonate at 2-week intervals (0.3, 0.6, and 1.0 mEq/d per kg ideal body weight). Timed 24-hour urine collections were performed during the final 2 days of each 2-week interval. Ideal body weight was calculated using the Devine Equation (18). To maintain participant blinding, identical pills were taken three times daily, with the total pill number remaining constant throughout the study. Participants returned at 2-week intervals for evaluation of medication tolerability, collection of blood and urine samples, and muscle strength testing. Adherence to study medication was assessed by pill count and calculated as the number of pills taken per total number of pills dispensed. Participants were withdrawn from the study if they developed serum bicarbonate>30 mEq/L, potassium<3.5 mEq/L, or eGFR<15 ml/min per 1.73 m2, were hospitalized for congestive heart failure, or experienced weight gain>2 kg or an increase of >15 mmHg systolic or 10 mmHg diastolic BP. BP was determined as the mean of three measurements taken at least 1 minute apart after a minimum of 5 minutes at rest in the seated position. Lower extremity edema was assessed clinically by a trained nephrologist (M.K.A.) and graded using the traditional four-point scale. Sit-to-stand (STS) time was measured by asking participants to sit in a straight-backed, noncushioned chair and then stand and sit 10 times in succession (19). The total time and the time after five repetitions were recorded. At each visit, the STS test was performed two times, with a minimum of 30 minutes separating the two measurements. The fastest time was used for analysis. Handgrip strength was measured three times with each hand using a handheld dynamometer (North Coast Medical, Inc., Gilroy, CA) (20). The maximum value was used for analysis. Baseline STS time and handgrip strength were defined using visit 2 values to minimize the impact of a training effect on our results. Serum and plasma samples were stored at −80°C if not analyzed immediately. Serum chemistry values were measured by routine procedures in the clinical laboratory at Montefiore Medical Center. Serum bicarbonate was measured using the phosphoenolpyruvate carboxylase method. Serum and urine creatinine were measured by a modified kinetic Jaffé reaction. Urine urea nitrogen was measured enzymatically and normalized to creatinine excretion. eGFR was calculated using the CKD Epidemiology Collaboration Equation (21). IGF-1, IGF binding protein 1 (IGFBP-1), IGFBP-3, and TNF-α (ALPCO Inc., Salem, NH) were measured using ELISA kits according to the manufacturer’s instructions. Mixed-effects models were fit using restricted maximum likelihood estimation to examine associations of sodium bicarbonate dose with repeated measurements of weight, BP, and all laboratory values using an exchangeable covariance structure. Models were also fit using an autoregressive covariance structure with no difference in results. For STS time and handgrip strength, end-of-study values were compared with visit 2 values using paired t tests. Predictors of response to therapy, defined as a ≥3 mEq/L increase in serum bicarbonate, were examined using unadjusted logistic regression models. All analyses were performed with Stata version 11.2 (Stata Corporation, College Station, TX). A P value<0.05 was considered statistically significant. The baseline characteristics of the study participants are shown in Table 1. Almost all had diagnoses of diabetes and hypertension with medication regimens that included diuretics and blockade of the renin-angiotensin system. Of note, 45% of participants had edema at study entry. The mean serum bicarbonate was 23.0±2.4 mEq/L. The median adherence to study medication was 98.0% (interquartile range=95.8–99.4). There was a stepwise increase in serum bicarbonate with increasing doses of sodium bicarbonate (Figure 1A). 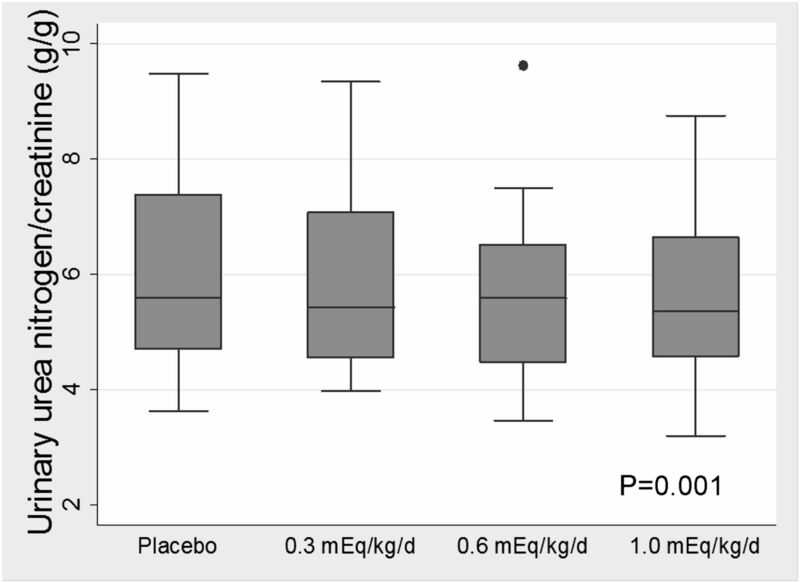 The mean serum bicarbonate was 22.2±2.8 mEq/L after 2 weeks of placebo and 23.6±2.7, 24.8±2.2, and 25.5±2.3 mEq/L after 2 weeks of 0.3, 0.6, and 1.0 mEq/kg per day, respectively. Each 0.1 mEq/kg per day increase in dose produced an increment of 0.33 mEq/L (95% confidence interval [CI]=0.23–0.43) in serum bicarbonate. Expressed in terms of absolute dose, there was a 0.56 mEq/L (95% CI=0.39–0.72) increase in serum bicarbonate for each 10 mEq/d higher dose. There was a small but statistically significant decrease in serum potassium (0.04 mEq/L [95% CI=−0.06 to −0.02] per 0.1 mEq/kg per day higher dose), translating into a 0.4 mEq/L reduction with the maximum dose (Figure 1B). There was no statistically significant change in systolic or diastolic BP (−0.2 [95% CI=−0.8 to 0.4] and 0.0 [−0.3 to 0.3] mmHg, respectively, per 0.1 mEq/kg per day higher dose) (Figure 1C). Although the mean weight of the participants did not significantly change between the baseline and final study visits (difference=0.57 kg [95% CI=−1.84 to 0.69]) (Figure 1D), the mixed-effects models showed a small but statistically significant intraindividual weight increase (0.10 kg [95% CI=0.02–0.20] per 0.1 mEq/kg per day higher dose). Clinical characteristics and laboratory parameters in relation to dose of oral sodium bicarbonate. Serum bicarbonate (A), serum potassium (B), systolic and diastolic BP (C), and body weight (D) in relation to dose of oral sodium bicarbonate. P values were calculated using mixed-effects models separately examining the association of sodium bicarbonate dose with repeated measurements of each outcome. Treatment with oral sodium bicarbonate improved both 5- and 10-repetition STS time (Table 2). To examine the possible contribution of a training effect, we compared visit 2 values with those values from visits 1 and 3. There was significant improvement from visit 1 to visit 2 in the 10-repetition STS time (−3.2 seconds [95% CI=−4.8 to −1.6]) but no statistically significant change from visit 2 to visit 3 (−0.3 seconds [95% CI=−1.3 to 0.6]). Similar results were found for the five-repetition time (data not shown). There was no significant difference in handgrip strength during the study. Urinary urea nitrogen excretion decreased with treatment (−0.70 g/g creatinine [95% CI=−1.11 to −0.30] per 0.1 mEq/kg per day higher dose) (Figure 2), whereas there was no statistically significant change in urine creatinine excretion (−48.5 mg [95% CI=−241.3 to 144.4] per 0.1 mEq/kg per day higher dose). Oral sodium bicarbonate was associated with a significant decrease in serum IGF-1, increased IGFBP-1, and lower IGF-1/IGFBP-3 ratio (Table 3). There was no significant change in TNF-α concentration (Table 3). Urinary urea nitrogen (factored by urine creatinine) in relation to dose of oral sodium bicarbonate. P value was calculated using a mixed-effects model. A response to therapy, defined as an increase in serum bicarbonate≥3 mEq/L, was seen in 11 of 20 participants. Only edema at baseline was associated with the likelihood of response in univariate analyses (Table 4). There was a 94% (95% CI=43%–99%) less likelihood of achieving response for patients with edema on study entry compared with patients without edema. However, the reduction in 10-repetition STS time after sodium bicarbonate therapy was similar for edematous (1.53 seconds [95% CI=−0.05 to 3.09]) and nonedematous (1.65 seconds [95% CI=0.28 to 3.01]) participants. Gastrointestinal symptoms of bloating, flatulence, stomach upset, and nausea were present in 60% of participants at study entry and were not more common with oral sodium bicarbonate (P=0.24) (Table 5). Similarly, edema and shortness of breath were not more common during treatment. Per protocol, two participants were withdrawn after 6 weeks, one for weight gain and one for increased BP. The first participant’s weight had increased 2.7 kg compared with study entry, but BP had decreased by 42/19 mmHg. The second participant’s BP increased 19/17 mmHg, whereas weight decreased 2.2 kg. No participants developed serum bicarbonate>30 mEq/L, potassium<3.5 mEq/L, or eGFR<15 ml/min per 1.73 m2. There were no hospitalizations for congestive heart failure. We found that oral sodium bicarbonate produces a dose-dependent increase in serum bicarbonate in patients with stages 3 and 4 CKD and mild metabolic acidosis, and it was well tolerated, even at high doses during a short-term intervention. Treatment with sodium bicarbonate was associated with an improvement in lower extremity muscle strength and lower urinary nitrogen excretion. Taken together, these results suggest that the treatment of acidosis reduced skeletal muscle protein breakdown and produced a concomitant improvement in skeletal muscle function. As such, oral alkali may have a role in preventing or improving functional limitations among people with CKD. Our results build on previous studies of the effects of chronic metabolic acidosis on skeletal muscle. A number of studies have shown that metabolic acidosis stimulates muscle protein turnover and that its correction reduces skeletal muscle breakdown (22,23). Importantly, treatment of acidosis partially corrected the PI3K/Akt signaling defect in a rat model of uremia (6). Furthermore, even mild acidosis may have detrimental effects on skeletal muscle. Treatment of healthy postmenopausal women with oral alkali improved nitrogen balance (24), and lower serum bicarbonate has been associated with reduced muscle strength and slower gait speed in the general population (25). Indeed, modest reductions in extracellular pH seem sufficient to stimulate muscle breakdown (23). It therefore seems likely that the changes in urinary nitrogen excretion and muscle strength that we observed resulted from improved PI3K/Akt signaling in skeletal muscle. The reduction in serum IGF-1 could indicate amelioration of an IGF-1 signaling defect in skeletal muscle (10,26). Alternatively, the increase in IGFBP-1 could stimulate IGF-1 action at the cellular level, despite lower serum IGF-1 (27,28). Higher serum IGFBP-1 could reflect improved insulin sensitivity (28), which has been shown with the treatment of acidosis and would reduce muscle proteolysis (29,30). It should be noted that the decrease in serum IGF-1 in our study contrasts with previous findings of an acidosis-induced impairment of growth hormone (GH)-stimulated IGF-1 expression (31). We did not have GH levels to address this question. Additional research is needed to better characterize the interaction of acidosis with the GH–IGF-1 axis and effects in skeletal muscle. Although previous studies examined physiologic changes resulting from the treatment of acidosis, no studies that we are aware of have assessed functional outcomes that could impact patients’ mobility and quality of life. Our study participants show the need for such data. Their STS times were comparable with dialysis patients’ times (32,33) and substantially slower than age-appropriate normal values (19). This result underscores the functional impairment already present among predialysis CKD patients. Muscle wasting likely contributes to this reduced exercise tolerance and poor physical function. One might expect a pharmacologic intervention that preserves muscle mass to positively affect functional status, but this finding remains unclear. Our findings of increased lower extremity muscle strength in concert with reduced urinary nitrogen excretion after alkali therapy suggest that long-term treatment of acidosis may improve performance status. However, this study was a short-term study, and even with the improvement that we noted, our participants’ 10-repetition STS time remained 4–6 seconds slower than healthy 60-year-old persons’ times (19). Additional research is needed to determine if this finding translates into a clinically meaningful improvement in outcomes. It is possible that our participants’ improved STS time resulted from a training effect. We attempted to limit this effect by using visit 2 values as the baseline and performing the STS test two times at each visit; therefore, improvement with practice would occur early in the study and not affect later measurements. There was noticeable improvement from visit 1 to visit 2 but no difference between visits 2 and 3, suggesting that a training effect did not contribute to any subsequent improvement. Thus, faster STS times likely represent real improvement in muscle strength. Because we did not examine the effect of each dose on STS time, we can only comment on the overall change after alkali administration. The treatment effect should not be attributed specifically to high-dose sodium bicarbonate. The effect of alkali on muscle strength could be questioned because of the lack of improvement in handgrip strength. However, other interventional studies have noted similar results. A resistance training program in dialysis patients, which included upper-body exercises, produced increases in lower extremity strength, walking speed, and STS time but no change in grip strength (32). Similarly, nandrolone administration increased dialysis patients’ lean body mass and improved walking and stair climbing times but not grip strength (20). Thus, interventions may improve a number of measures of muscle strength more readily than handgrip. The reasons are unclear, although differences in muscle fiber type could be one factor. Long-term studies are needed to determine if this pattern of changes translates into an overall improvement in functional status. We found that participants with edema were significantly less likely to achieve a ≥3 mEq/L increment in serum bicarbonate with oral alkali. No other factors were associated with the likelihood of response. The mechanism underlying this association is unclear. Participants with edema may have had a larger bicarbonate space, possibly because of lower baseline pH or increased extracellular volume, although we cannot rule out other etiologies, such as tubular bicarbonate wasting. Nevertheless, the presence of edema may indicate larger alkali requirements to optimally correct acidosis. It is this patient subgroup that clinicians may be most hesitant to treat with high-dose alkali because of concerns of fluid retention and worsened BP control. This finding highlights a potential complexity of treating acidosis in clinical practice. Several important limitations of our study should be noted. Treatment assignment was not randomized, and only the participants were blinded to treatment status. This study was small, and certain findings, including associations with the increment of serum bicarbonate, may have been chance findings. We also cannot distinguish between the effects of time and dose with our study design. Therefore, our results should be interpreted with caution and require confirmation from a larger randomized placebo-controlled trial. Metabolic acidosis was defined using serum bicarbonate alone without other data regarding acid–base status. However, this definition is in accord with Kidney Disease Outcomes Quality Initiative guidelines, which suggest treatment of acidosis based on the serum bicarbonate alone (34). Also, previous studies of patients with CKD and metabolic acidosis using similar doses of sodium bicarbonate noted higher extracellular pH in parallel with an increase in serum bicarbonate (30,35). We would predict a similar pattern in our study. However, beneficial effects of alkali may be seen independently of the change in serum bicarbonate or pH. Participants with edema experienced similar reductions in STS time as those participants without edema, despite smaller increments in the serum bicarbonate. A study of patients with mildly reduced eGFR and normal serum bicarbonate found that changes in urine net acid excretion may be seen even without a change in blood acid–base parameters (36). Finally, we have speculated regarding a mechanistic explanation for our results based on the reduction in urinary nitrogen, although we are unable to definitively comment on nitrogen balance. Nitrogen balance should be confirmed by studies of alkali that include measures of lean body mass and direct assessment of muscle protein breakdown, which could include measurement of a 14-kDa actin fragment (37) in muscle biopsy specimens along with other changes in skeletal muscle at the cellular level. In conclusion, oral sodium bicarbonate was well tolerated, even at high doses, during a short-term intervention in patients with CKD and mild metabolic acidosis. It produced a dose-dependent increase in serum bicarbonate, and it was associated with an improvement in lower extremity muscle strength and reduced urinary nitrogen excretion. Future studies should determine if long-term use of oral alkali results in a clinically meaningful improvement in functional outcomes in patients with CKD. T.H.H. has consulted for Bristol Myers Squibb, Eli Lilly, Genzyme, and Wyeth. None of the other authors has any financial conflicts to disclose. Portions of this work were presented at the American Society of Nephrology Renal Week in Denver, CO (November 16–21, 2010). This research was supported by National Institutes of Health Grants K23DK078774 (to M.L.M. ), R21DK077326 (to T.H.H. ), R01DK087783 (to T.H.H. ), and R01DK080123 (to T.H.H.) and Clinical and Translational Science Award Grants UL1RR025750, KL2RR025749, and TL1RR025748 from the National Center for Research Resources, a component of the National Institutes of Health. See related editorial, “The Role of Bicarbonate in CKD: Evidence Bulks Up,” on pages 703–705.